Hi Beauties, it's time to share another hair product I've discovered, my love of hair products strikes again! I think I've mentioned how much I like Label M products before and I've been a fan of their Curl Cream for a long time now but I have recently discovered their Protein Spray. The one pictured below is just a little 50ml spray I got from the Look Fantastic website, I thought I'd try it before I bought a full sized one, I love tester products as it's a great way to find out if you like the product before you invest, it's particularly good for products that are a bit on the expensive side. A full sized 250ml spray costs £13.25 from lookfantastic.com while the small 50ml version is about £4.50. If you haven't been on the Look Fantastic website then I can definitely recommend it, there's loads of great stuff on there. 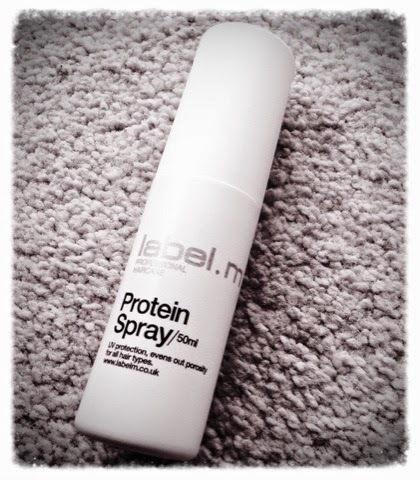 Unsurprisingly, Label M Protein Spray didn't disappoint me, it smells gorgeous, "a moisturising blend of jasmine, sweet pea, vanilla, wheat and soy" and is used on towel dried hair as a leave in conditioner. My hair felt really shiny and strong (that must have been the protein! ), I was particularly pleased with the shiny aspect as my hair generally doesn't have much of a shine to it no matter what I put on it! I've also used it as a pick me up on dry hair. The Label M range is really quite extensive and was designed by Toni & Guy for their salons which is where my hairdresser recommended the curling cream, I have also used the curl spray but prefer the cream as it gives a more defined curl and I think it has a nicer scent. Label M can be purchased from Toni & Guy salons but it is quite expensive, so I tend to find it online where you can get it a bit cheaper. The 250ml bottle is better value but if you're travelling the 50ml is very handy as its easy to transport. My regular leave in conditioner is from the Aussie range and I will continue to use that and probably use this a couple of times a week or when my hair needs a treat. Sharing this with you quickly as it's my absolute favourite nail varnish of the moment. I'm a fan of Rimmel as they are really good value and there's always a huge range of colours. I picked up this Rita Ora for Rimmel nail varnish when I was out shopping the other day, this post is about the pink one, I also tried a blue one which looks gorgeous in the bottle, alas did not suit me at all though it was a beautiful colour, my pale hands couldn't carry off that shade. The reason I am wearing this one all the time at the moment is partly due the colour, it's a nice fresh Spring pink called Sweet Retreat which seems to go with everything and also it's a base coat, polish and a top coat all in one so this means that chipping is reduced. When I've been in a hurry I've just popped one coat on and it's been really good for a day or so but obviously two coats is better. It doesn't dry very quickly so you do need to remember to leave it to dry properly, it's not a 60 second drier. One of the best things about this product is that when you take it off you don't need to scrub away at your nails in order to get it to come off, it slides off really easily with polish remover which is great if you're in a hurry. I'm on the look out for another couple of these as I'm going on holiday soon and they would be perfect to pack and take along. I'd love to know if you've tried any of the Rita Ora nail varnishes and what you thought of them.